Bishop Amat beat Valencia to win the Bonita Air Assault on Saturday night. The Lancers won the tournament for the second consecutive season. Amat beat Charter Oak 30-28 in the semifinals to reach the championship game. Valencia beat Monrovia to reach the finals. Villa Park won the consolation championship over host Bonita. GAME OF THE DAY: Pomona beat Bishop Amat in pool play after Eric Harper intercepted a pass in the closing seconds of a tie game with Amat driving. The win gave the Devils two points and led to a 34-32 final. Pomona jumped all over Amat early but the Lancers found their sea legs and battled back and were on the doorstep of a win before the interception. Kudos to the Pomona fans who ran their smack earlier this week. The Devils look real, real good. Nobody in the Miramonte League is touching them and they look like real legit Mid-Valley Division title contenders. Lotsa talent. Amped up coaching staff who looks to have a good thing going on. As for Amat, QB play looks to be a serious issue as of now. A lot of guys broke open, the QBs saw it too late and the balls got their too late. But that’s what all this is for … so hopefully things get better. Both Amat and Pomona went 4-1 in the pool. La Mirada wide receiver/defensive back Tony Brown was named wide receiver MVP at the USC Rising Stars Camp on Wednesday. 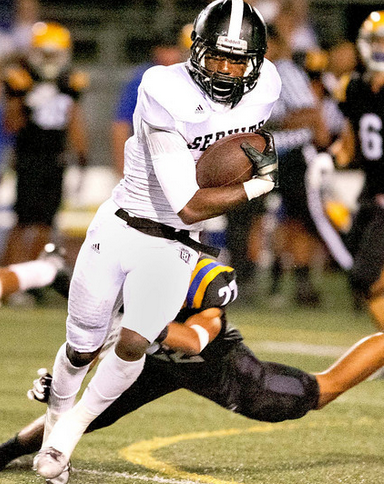 Brown transferred to La Mirada from Servite this offseason and figures to be one of the top weapons around. He has eight college offers currently from SMU, Utah, Purdue, Washington St., Iowa St., San Jose St., Utah St. and Colorado. Brown and another transfer, QB Christian Lara (formerly of Santa Fe), are big reasons why there are high expectations for La Mirada yet again. UPDATE: Despite missing the first three days of Diamond Bar football practice, Noodles’ mom has told me he will play at Diamond Bar and that the delay in him not practicing is due to not getting a physical yet. GREAT GREAT NEWS for D-Bar and local fans as Noodles will be one of the top talents around and should help D-Bar compete in the Palomares League. UPDATE: Noodles also missed second day of practice on Tuesday. The mass exodus of talent (and coaches) at Diamond Bar High doesn’t look to be over … In the latest sign of attrition from last year’s Brahmas’ talent base, Antonio “Noodles” Hull was a no-show for the team’s first practice on Monday. 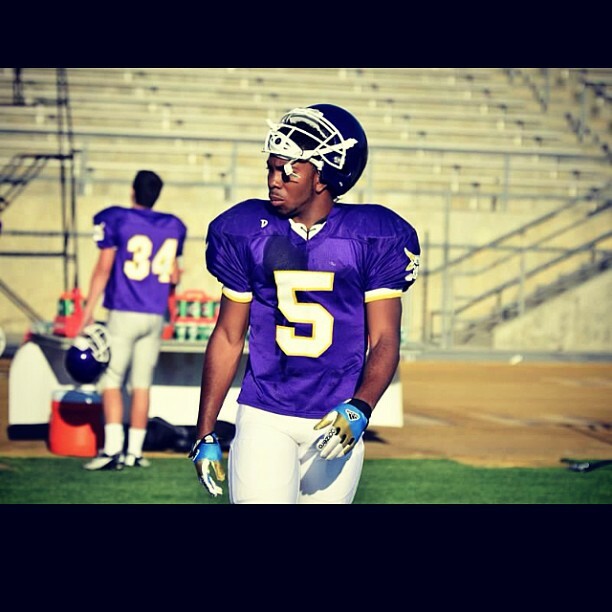 Also, the hot rumor is that receiver/defensive back Kanya Bell, who is recovering from a knee injuy, is headed to Long Beach Poly. The rumor about Noodles is that he may be headed to Carson for his senior season. New head coach Marcus Hughes said he spoke to Hull last week and was told by the senior that he will be a Brahma this fall. If Bell and Hull both leave, they would join Cordell Broadus, Cameron Hayes and Brian Lamb as having left the program after being some of the top talent at the school. Lamb reportedly followed Broadus to Bishop Gorman in Las Vegas, but is now believed to be at Citrus Hill in Corona Redlands. As for Hayes? You tell me. Not exactly the greatest situation for new head coach Hughes to inherit. The Brahmas, had all or most of the talent stuck around, would have been one of the top teams in the area this fall. Look for Vasquez to terrorize opposing QBs this season off the edge for the Lancers. Hoping he’s something of a Julian Gener-type guy for Amat. Vasquez is a protege of former Los Altos star Brigham Harwell’s Trench Hogs, which is a workout group just for linemen types.